Holacracy: A Management System Based On Self-Organization - iSmallBusiness.com - Small Business Stuff That Matters...Pass It On! 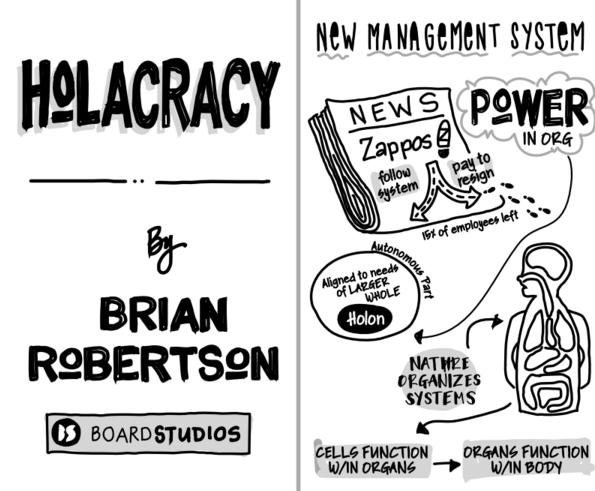 Holacracy made headline news when Zappos mandated that all its employees follow the system or take a pay to resign, and 15 percent of the employees took the option to leave. Its name indicates that the power in an organization resides within each “holon” or autonomous part that is aligned to the needs of a larger whole. This structure resembles how nature organizes like the human body, where cells function autonomously within organs, which in turn function autonomously within the body. The main idea behind this new system is that today’s companies have to survive in an increasingly complex and dynamic environment that requires an equally dynamic organizational structure in order to properly address new challenges and opportunities. The solution germinated from the observation that humans have a unique ability to sense tension within an organization, which is defined as recognizing the gap between what currently exists, and what could be – the current reality . . . and the sensed potential. Holacracy is a system that aims to make companies evolutionary by capitalizing on this unique ability that we have. By doing away with the concept of manager, it effectively breaks down communication and collaboration barriers formed by traditional, siloed pyramid org structures. Managers like the new system because they don’t have to spend their entire days solving everyone’s problems. And employees like it because they feel truly empowered to act on tensions – problems and opportunities – that they recognize. Instead of thinking of a company as a pyramid of people in different departments with different authorities, think of it as a set of nested circles that consist of different roles, not people. For example, a company may have a production, a marketing, and a finance role. And a person can fill more than one role. For example, the founder may fill the marketing and finance roles in a startup, while an employee fills the production role. All these roles live within a circle, which is simply a group of roles. As a company evolves and roles become too complex, they can break into sub-circles. In the previous example, the marketing role can later evolve into a marketing circle that encompasses the roles of client communications, advertising, and social media. One of the key innovations of holacracy is that the person who fills a role is empowered to execute an assignment the best way he or she sees fit. There’s no manager to over-ride that decision, and no one has such authority – not even the CEO. In this sense, Holacracy creates a very flat and truly empowering organization. Let’s say that one of the members of a company’s marketing circle brings up a tension that the company needs to have a presence on the LinkedIn platform. During a governance meeting, the task is assigned to the role of social media. That means that the person that fills that role is responsible for coming up with a proposal to resolve the tension. At an upcoming operational – or tactical – meeting, the proposer presents a LinkedIn strategy that involves posting funny videos on the company’s LinkedIn page. After some clarifications, the meeting moves on to the objections round, where the client communications person says that funny videos won’t appeal to the company’s B2B target audience. The proposer amends the proposal to replace funny videos with news-related posts. Once there are no more objections, the proposal gets adopted. 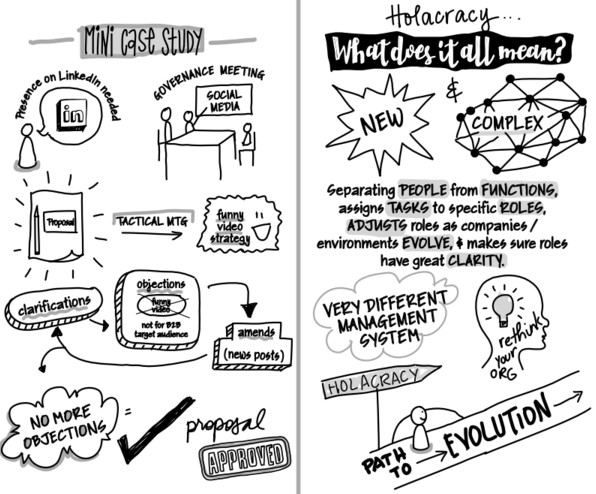 The holacracy playbook is new and feels fairly complex. It starts by separating people from functions, assigns tasks to specific roles, dynamically adjusts roles as companies and their environments evolve, and makes sure that roles have great clarity. But this is just the beginning. Holacracy is a very different management system that requires you to rethink your organization from the ground up. It may feel awkward, foreign, and uncomfortable at first, but it may be the only path to install evolution within your company.